A quick and easy gluten-free dessert, these red wine poached pears would gorgeously decorate your dinner table. The winter months are prime fresh pear season, so serve up red wine poached pears for your loved ones this winter season. 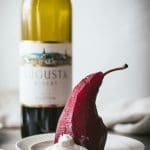 This red wine poached pear dessert is naturally gluten-free and is paired with a fresh dairy-free coconut cream. 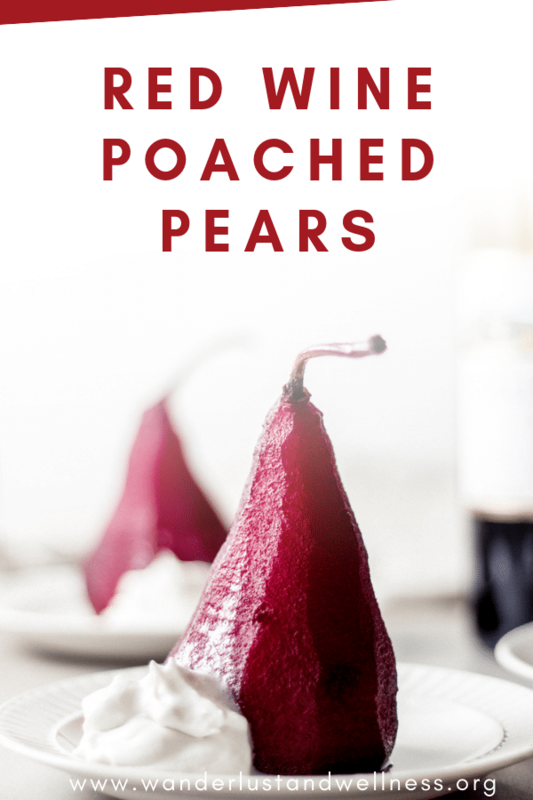 What are red wine poached pears? Red wine poached pears are fresh pears that have been simmered in red wine, along with spices of your choice, until soft and tender. They make for a quick and easy dessert that is gorgeous and elegant. What type of pears are best for poaching? While any fresh pear will work, the Bosc pear tend to poach the best. They keep their shape when cooked, plus they have that distinctive long, slender neck shape which makes for a gorgeous dessert. What type of red wine is good for red wine poached pears? To pair with the sweetness of the fresh pear, I suggest using a dry red. For this recipe, I used a Missouri Norton, specifically the Augusta Winery Norton. 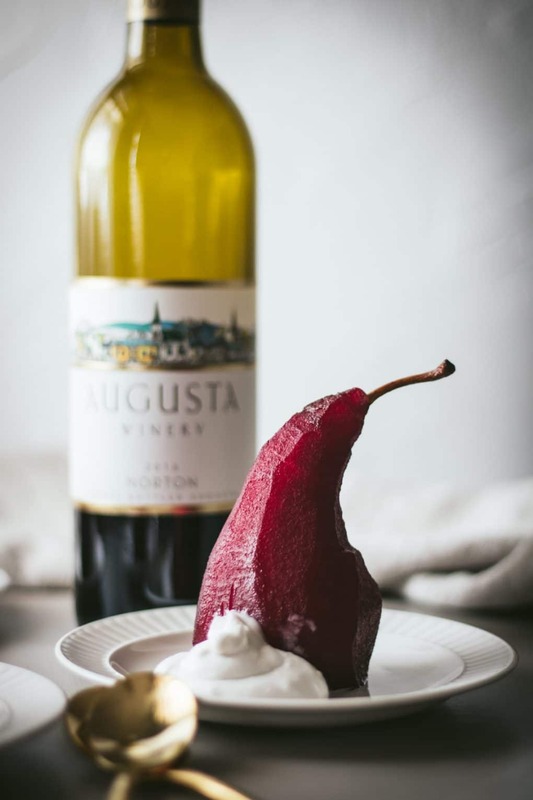 Made from the Norton grape, the Augusta Norton has a deep burgundy color, which creates that gorgeous color in the poached pear. 1 bottle of red is sufficient to poach 4 fresh Bosc pears. While the recipe calls for adding in fresh cinnamon sticks, feel free to add additional spices if you’d like. 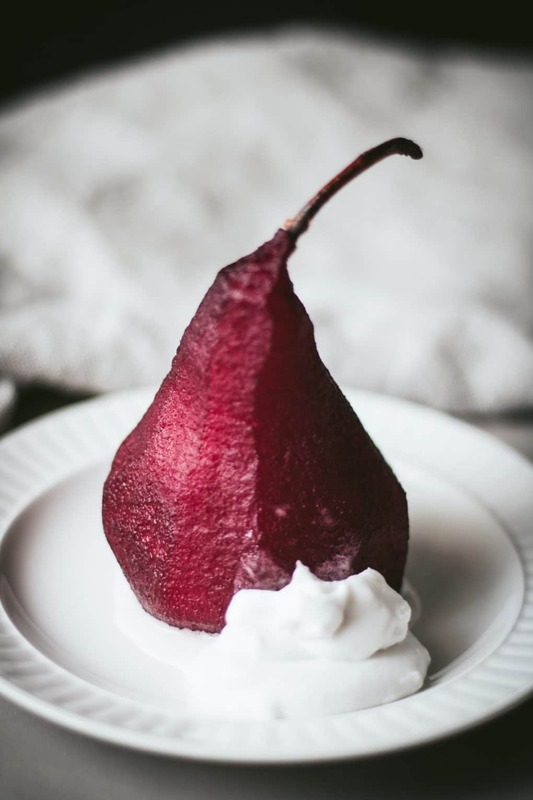 Serve the red wine poached pears with a fresh batch of coconut cream. 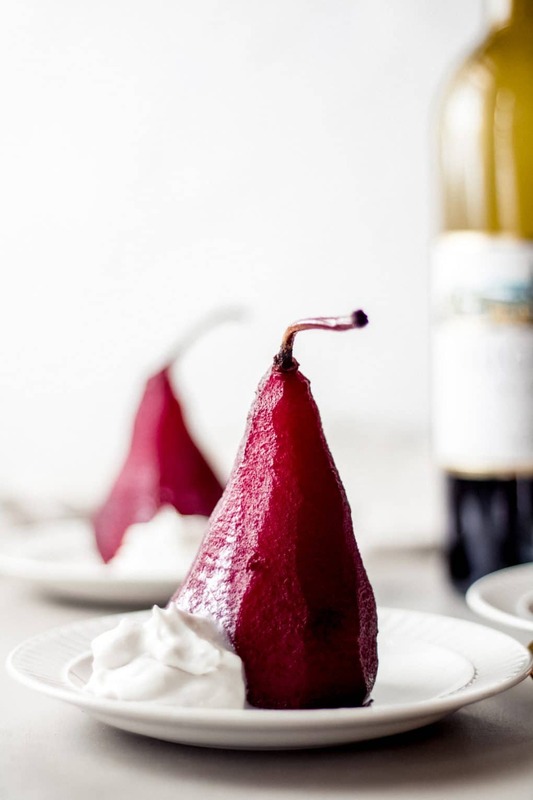 Celebrate the ones you love this year with dinner and gorgeous red wine poached pears for dessert, featuring Missouri wines. Add the red wine, vanilla, cinnamon sticks, and sugar to a large saucepan or dutch oven. Simmer over medium heat until the sugar is dissolved. While the red wine is simmering, carefully peel the skin off of the Bosc pears, leaving the stem in place. Slice off the bottom of the pears so that they will sit flat. Add the pears to the wine and simmer for 30-45 minutes or until the pears are softened. If the pears are not fully submerged, turn them halfway through the cook time. When soft, carefully remove from the pan and stand upright on a plate to cool for about 5 minutes. Serve warm, with fresh coconut cream. Adjust the cooking time as needed for the pears. If the pears are not ripe, they may take longer to soften and vice versa. Here are a few more desserts to try!